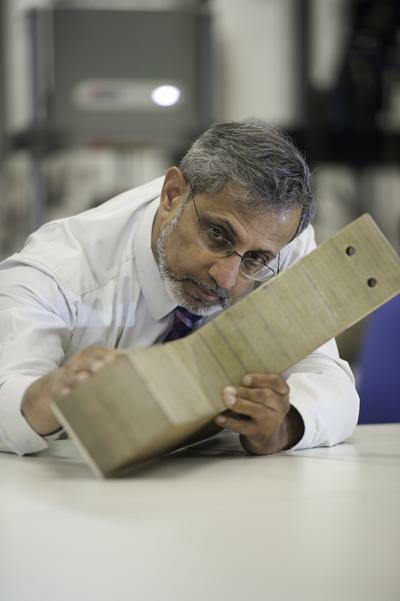 Professor R Ajit Shenoi is Director, Southampton Marine and Maritime Institute and the Lloyd’s Register / Royal Academy of Engineering Professor of Lightweight Structures within Engineering and Physical Sciences at the University of Southampton. Professor Ajit Shenoi graduated in 1974 with a degree in naval architecture from the Indian Institute of Technology, Kharagpur. Between 1974 and 1978 he worked successively in Mazagon Docks Bombay and Arya National Shipping Lines, Tehran before returning to academe, to the University of Strathclyde, Glasgow from where he obtained his doctorate in 1981. Since then he has been at the University of Southampton as Lecturer, Senior Lecturer, Reader and, now, Professor. He is a Chartered Engineer, being a Fellow of both the Institution of Mechanical Engineers and the Royal Institution of Naval Architects. Bai, J. B., Xiong, J. J., Shenoi, R., & Wang, Q. (Accepted/In press). A Micromechanical model for predicting biaxial tensile moduli of plain weave fabric composites. The Journal of Strain Analysis for Engineering Design. Bai, J. B., Xiong, J. J., Shenoi, R., & Zhu, Y. T. (2017). Analytical solutions for predicting tensile and in-plane shear strengths of triaxial weave fabric composites. International Journal of Solids and Structures. Xue, X. G., Li, G. X., Sobey, A. J., & Shenoi, R. A. (2013). The application of reliability based optimization of tophat stiffened composite panels subject to bi-directional buckling loads. Materials Science and Engineering: A, 3(11), 721-733. Sobey, A. J., Blake, J. I. R., Shenoi, R. A., & Waddams, A. (2009). Concurrent Engineering in the context of FRP boats. Ship and Boat International. Sobey, A. J., Blake, J. I. R., & Shenoi, R. A. (2009). Concurrent Engineering in the context of FRP boats. Via Mare. Sobey, A., Blake, J., & Shenoi, A. (2009). Design histories for enhanced concurrent structural design. World Academy of Science, Engineering and Technology, 3(2), 76-87. Wang, W., & Shenoi, R. A. (2009). Investigating high strain rate behaviour of unidirectional composites by a visco-elastic model. Journal of Ship Mechanics, 13(3), 406-415. Sobey, A., Blake, J. I. R., & Shenoi, R. A. (2009). Optimisation approaches to design synthesis of marine composite structures. Ship Technology Research / Schiffsteknik, 56(1), 24-30. Sobey, A., Blake, J. I. R., & Shenoi, R. A. (2008). Comparative optimisation of first principles design methods with classification society rules for boat hull structures. Ship Technology Research / Schiffsteknik, 55, 502-515. Lewis, S. G., Hudson, D. A., Turnock, S. R., Blake, J. I. R., & Shenoi, R. A. (2007). A comparison of experimental measurements of high-speed RIB motions with non-linear strip theory. Australian Journal of Mechanical Engineering, 4(2), 165-182. Boyd, S. W., Blake, J. I. R., Shenoi, R. A., & Mawella, J. (2007). Co-cured structural steel-composite joints for deck to superstructure connections. Transactions of The Royal Institution of Naval Architects Part A: International Journal of Maritime Engineering, 149(A4), 83-99. Eksik, Ö., Shenoi, R. A., Moy, S. S. J., & Jeong, H. K. (2007). Experiments on top hat stiffened panels of FRP boat structures. Marine Technology, 44(1), 1-15. Eksik, Ö., Shenoi, R. A., Moy, S. S. J., & Jeong, H. K. (2007). Finite element analysis of top hat stiffened panels of FRP boat structures. Marine Technology, 44(1), 16-26. Maneepan, K., Shenoi, R. A., Blake, J. I. R., & Jeong, H. K. (2007). Genetic algorithms (GAs) based optimisation of FRP composite plated grillages in ship structures. Transactions of The Royal Institution of Naval Architects Part A: International Journal of Maritime Engineering, 149(Part A3), 1-19. Cripps, R. M., Dulieu-Barton, J. M., Jeong, H. K., Phillips, H. J., & Shenoi, R. A. (2006). A generic methodology for post-damage decisions. Journal of Ship Production, 22(1), 21-32. Wang, W., Shenoi, R. A., & Cui, W. (2006). Delamination buckling of a curved composite beam subjected to a closing bending moment. Journal of Ship Mechanics, 10(6), 102-114. Shenoi, R. A., Conti, P., Turnock, S. R., & Scarponi, M. (2006). Mini 6.50 Mast optimisation using a design of experiment approach and finite element analysis simulations. International Journal of Small Craft Technology, 148(B1), 41-49. Shenoi, R. A. (2006). Modelling structural capability in FRP ship structures. Schiffbauforschung, 45(1), 46-58. Boyd, S. W., Blake, J. I. R., Shenoi, R. A., & Mawella, J. (2004). Fatigue life and residual strength analysis of steel-composite joints. Applied Mechanics and Materials, 1-2, 81-86. Boyd, S. W., Blake, J. I. R., Shenoi, R. A., & Kapadia, A. (2004). Integrity of hybrid steel-to-composite joints for marine application. Proceedings of the Institution of Mechanical Engineers, Part M: Journal of Engineering for the Maritime Environment, 218(4), 235-246. Kecsmar, J., & Shenoi, R. A. (2004). Some notes on the influence of manufacturing on the fatigue life of welded aluminum marine structures. Journal of Ship Production, 20(3), 164-175. Jeong, H. K., & Shenoi, R. A. (2002). Probabilistic failure analysis of a fibre-reinforced plastic sandwich plate subjected to a lateral pressure load. Proceedings of the Institution of Mechanical Engineers, Part L: Journal of Materials: Design and Applications, 216(2), 115-126. Cunningham, P. R., Dulieu-Barton, J. M., Dutton, A. G., Shenoi, R. A., & Priolo, P. (Ed.) (2002). The effect of ply lay-up upon the thermoelastic response of laminated composites. Proceedings of 5th International Seminar on Experimental Techniques and Design of Composite Materials, Key Engineering Materials, (222), 325-336. Ring, D., Shenoi, R. A., & Courts, M. (2001). Application of goal tree - success tree (GTST) technique to decompose ship design in a production context. Proceedings of the Institution of Mechanical Engineers, Part B: Journal of Engineering Manufacture, 215(1), 79-92. Shenoi, R. A., & Wang, W. (2001). Flexural behaviour of a curved orthotropic beam on an elastic foundation. The Journal of Strain Analysis for Engineering Design, 36(1), 1-15. Jeong, H. K., & Shenoi, R. A. (2001). Structural reliability of fibre reinforced composite plates. RINA Transactions Part B, 143, 73-98. Cunningham, P. R., Dulieu-Barton, J. M., Dutton, A. G., & Shenoi, R. A. (2001). Thermoelastic characterisation of damage around a circular hole in a GRP component. Key Engineering Materials, 221-222, 453-463. Jeong, H. K., Shenoi, R. A., & Kim, K. S. (2000). Reliability analysis of thick FRP plates. Journal of Ship and Ocean Technology, 4(2), 38-57. Jeong, H., Shenoi, R. A., & Kim, K. (2000). Structural reliability of thick FRP plates subjected to lateral pressure loads. Journal of Ship and Ocean Technology, 4, 38-57. Deshpande, A., Goh, A. L., Goossens, A., Javdani, S., Shenoi, R. A. (Ed. ), Wilson, P. A. (Ed. ), & Bennett, S. (Ed.) (2013). Biomimicry for coastal eco-cities: towards a carbon neutral Dover, UK. (LRF Collegium 2013 Series; Vol. 4). University of Southampton. Cusano, M. I., Li, Q., Obisesan, A., Urrego-Blanco, J. R., Wong, T. H., Shenoi, R. A. (Ed. ), ... Bennett, S. S. (Ed.) (2013). Coastal city and ocean renewable energy: pathway to an eco-San Andres. (LRF Collegium 2013 Series; Vol. 3). University of Southampton. Chakraborty, S., Dzielendziak, A. S., Koroglu, T., Yang, K., Shenoi, R. A. (Ed. ), Wilson, P. A. (Ed. ), & Bennett, S. S. (Ed.) (2013). Evaluation of smart eco-friendly public transport options in coastal cities: towards a green future for the city of Southampton. (LRF Collegium 2013 Series; Vol. 2). University of Southampton. Fernandez, N., Kim, S. J., Morsy, Z. M., Novak, V. M., Shiraishi, K., Shenoi, R. A. (Ed. ), ... Bennett, S. S. (Ed.) (2013). Improving urban resilience in coastal eco-cities: system integration. (LRF Collegium 2013 Series; Vol. 1). University of Southampton. Divakaran, P., Kapnopoulou, V., McMurtry, E., Seo, M-G., Yu, L., Shenoi, R. A. (Ed. ), ... Bennett, S. S. (Ed.) (2013). Towards an integrated framework for coastal eco-cities. (LRF Collegium 2013 Series; Vol. 5). University of Southampton. Bashir, M. B., Kim, S. H., Kiosidou, E., Wolgamot, H., Zhang, W., Shenoi, R. A. (Ed. ), ... Bennett, S. S. (Ed.) (2012). A concept for seabed rare earth mining in the eastern South Pacific. (The LRET Collegium 2012 Series: Seabed Exploitation; Vol. 1). University of Southampton. Agarwal, B., Hu, P., Placidi, M., Santo, H., Zhou, J. J., Shenoi, R. A. (Ed. ), ... Denchfield, S. S. (Ed.) (2012). Feasibility study on manganese nodules recovery in the Clarion-Clipperton Zone. (The LRET Collegium 2012 Series: Seabed Exploitation; Vol. 2). Southampton, GB: University of Southampton. Flentje, W., Lee, S. E., Virnovskaia, A., Wang, S., Zabeen, S., Shenoi, R. A. (Ed. ), ... Bennett, S. S. (Ed.) (2012). Polymetallic nodule mining: innovative concepts for commercialisation. (The LRET Collegium 2012 Series: Seabed Exploitation; Vol. 5). University of Southampton. Egorov, L., Elosta, H., Kudla, N. L., Shan, S., Yang, K-K., Shenoi, R. A. (Ed. ), ... Bennett, S. S. (Ed.) (2012). Sustainable seabed mining: guidelines and a new concept for Atlantis II Deep. (The LRET Collegium 2012 Series: Seabed Exploitation; Vol. 4). Southampton, GB: University of Southampton. Parada, J., Feng, X., Hauerhof, E., Suzuki, R., Abubakar, U., Shenoi, R. A. (Ed. ), ... Bennett, S. S. (Ed.) (2012). The deep sea energy park: harvesting hydrothermal energy for seabed exploration. (The LRET Collegium 2012 Series: Seabed Exploitation; Vol. 3). Southampton, GB: University of Southampton. Livermont, E. A., Koh, Y., Mlambo, T., Bhawanin, M., Zhao, B., Shenoi, R. A. (Ed. ), & Wilson, P. A. (Ed.) (2011). Carbon capture and storage in deep ocean space for the 21st century: guidelines for implementation in China. (The LRET Collegium 2011 Series: Carbon Capture and Sequestration in Ocean Space; No. 1). Southampton, GB: University of Southampton. Xiong, J. J., & Shenoi, R. A. (2011). Fatigue and fracture reliability engineering. (Springer Series in Reliability Engineering). London, GB: Springer. Feng, A., Kim, T., Li, X., Riaz, Z., Wee, J., Shenoi, R. A. (Ed. ), & Wilson, P. A. (Ed.) (2011). Offshore renewable energy powered CO2 injection: a small carbon footprint solution. (The LRET Collegium 2011 Series: Carbon Capture and Sequestration in Ocean Space; No. 4). Southampton, GB: University of Southampton. Winden, B., Chen, M., Okamoto, N., Kim, D. K., McCaig, E., Shenoi, R. A. (Ed. ), & Wilson, P. A. (Ed.) (2011). Offshore Thermal Power with CCS: An Alternative to CO2 Transportation. (The LRET collegium 2011 Series: Carbon Capture and Sequestration in Ocean Space; Vol. 2). Southampton, GB: University of Southampton. Cheng, N., Furth, M., Johnson, M. C., Tay, Z. Y., Shenoi, R. A. (Ed. ), & Wilson, P. A. (Ed.) (2011). The key to successful carbon capture and storage: engaging the public. (The LRET Collegium 2011 Series: Carbon Capture and Sequestration in Ocean Space; No. 3). Southampton, GB: University of Southampton. Frieze, P. A., & Shenoi, R. A. (Eds.) (2006). Proceedings of the 16th International Ship and Offshore Structures Congress. Southampton, UK: University of Southampton Press. Claughton, A. R., Wellicome, J. F., & Shenoi, R. A. (Eds.) (2006). Sailing Yacht Design : Practice. Southampton, UK: University of Southampton Press. Claughton, A. R., Wellicome, J. F., & Shenoi, R. A. (Eds.) (2006). Sailing yacht design: theory: 2nd revised edition. Southampton, UK: University of Southampton,Computing Service. Shenoi, R. A., Groves, A., & Rajapakse, Y. D. S. (Eds.) (2005). Theory and applications of sandwich structures. Southampton, UK: University of Southampton Press. Shenoi, R. A., & Moy, S. S. (Eds.) (2002). Advanced polymer composites for structural applications in construction. London, UK: Thomas Telford. Shenoi, R. A., Barton, J., Quinn, S., Blake, J. I. R., & Boyd, S. W. (2011). Composite materials for marine applications – key challenges for the future. In L. Nicolais, M. Meo, & E. Milella (Eds. ), Composite Materials: a Vision for the Future (pp. 69-91). London, GB: Springer. Loscombe, R., & Shenoi, R. A. (2006). Materials in construction. In A. R. Claughton, W. Claughton, J. F. Wellicome, & R. A. Shenoi (Eds. ), Sailing Yacht Design: Theory. 2nd Revised Edition (pp. 145-162). Southampton, UK: University of Southampton,Computing Service. Nayak, A. K., & Shenoi, R. A. (2005). Finite element analysis of sandwich plates and shells. In R. A. Shenoi, A. Groves, & Y. D. S. Rajapaske (Eds. ), Theory and Applications of Sandwich Structures (pp. 267-286). Southampton, UK: University of Southampton Press. Shenoi, R. A., Allen, H. G., Moy, S. S. J., & Feng, Z. N. (1995). The behaviour of single-skin FRP plate structures under extreme lateral pressure loading. In C. F. L. Kruppa (Ed. ), FAST '95, 3rd International Conference on Fast Sea Transportation, 25-27 Sept 1995; Lubeck-Travemunde, Germany (pp. 341-353). Germany: Schiffbautechnische Gesellschaft. Wang, Y., Ilman, E. C., Sohan Roy, N., Sobey, A., Wharton, J., & Shenoi, R. (Accepted/In press). Implementation of in situ corrosion measurements in structural analysis. In 7th International Conference on Marine Structures	MARSTRUCT Virtual Institute. Wang, Y., Shenoi, A., Wharton, J., & Downes, J. (2017). Marine structural integrity subject to mechano-electrochemical induced corrosion. Paper presented at NACE Corrosion 2017, United States. Bowker, J. A., Townsend, N., Tan, M., & Shenoi, A. (2015). Experimental study of a wave energy scavenging system onboard autonomous surface vessels (ASVs). Paper presented at OCEANS’15 MTS/IEEE Genova, Italy. Pham, D. C., Narayanaswamy, S., Qian, X., Sobey, A., Achintha, M., & Shenoi, A. (2014). Composite riser design and development – a review. Paper presented at 5th International Conference on Marine Structures, United Kingdom. Zhu, G., Xiong, Y., Daley, S., & Shenoi, R. (2014). Experimental study and mathematical modelling on dependent shear properties of MRE material. Paper presented at 14th International Conference on Electrorheological Fluids and Magnetorheological Suspensions (ERMR2014), Spain. Gravina, J., Blake, J. I. R., Shenoi, R. A., Turnock, S. R., & Hirdaris, S. (2013). Concepts for a modular nuclear powered containership. Paper presented at 7th International Conference on Ships and Shipping Research, Italy. Zhu, G., Xiong, Y., Daley, S., & Shenoi, A. (2013). Mathematical modelling and dynamical analysis of a magnetorheological elastomer tuneable absorber. Paper presented at The Ninth International Conference on Vibration Engineering and Technology of Machinery VETOMAC-IX 2013, China. Aktas, A., Boyd, S., & Shenoi, A. (2013). monitoring and simulation of the vacuum infusion process. Paper presented at 19th International Conference on Composte Materials, . Townsend, N. C., & Shenoi, R. A. (2013). Recharging autonomous underwater vehicles from ambient wave induced motions. Paper presented at OCEANS13, United States. Wang, Y., Wharton, J., & Shenoi, A. (2013). The influence of localised pit distribution on the ultimate strength of ship structural members. Paper presented at 4th International Conference on Integrity, Reliability & Failure, Portugal. Winden, B., Chen, M., Okamoto, N., Kim, D. K., McCaig, E., Shenoi, R. A., & Wilson, P. A. (2012). An investigation into the logistical and economical benefits of using offshore thermal power in a future CCS scheme. Paper presented at International conference on greenhouse gas technologies (GHGT), Japan. Zhu, G., Xiong, Y., Daley, S., & Shenoi, A. (2012). Dynamical analysis of a two-stage non-linear MRE vibration isolation system. Paper presented at 19th International Congress on Sound and Vibration (ICSV19), Lithuania. Sapouna, K., Xiong, Y. P., & Shenoi, R. A. (2012). Nonlinear viscoelastic model of isotropic and anisotropic magnetorheological elastomers. Paper presented at 4th International Conference “Smart Materials, Structures and Systems" (CIMTEC2012), Italy. Nicholls-Lee, R. F., Turnock, S. R., Tan, M., McDonald, P. C., & Shenoi, R. A. (2011). Development of a prototype test rig for a cryogenic, marine, heavy lift, buoyancy system. Paper presented at 30th International Conference on Ocean, Offshore and Arctic Engineering, Netherlands. Franklin, M., Shenoi, R. A., Wilson, P. A., Turnock, S. R., & Hudson, D. A. (2011). Interdisciplinary research collegium in advanced maritime systems design. Paper presented at RINA International Conference on the Education and Professional Development of Engineers in the Maritime Industry, . Shenoi, A., Blake, J., & Moshrefi-Torbati, M. (2011). Reliability engineering for composites. MBDA Workshop on Probabilistic Design, United Kingdom. Sheridan, J. A., Shenoi, R. A., Hudson, D. A., & Neill, A. (2011). Why is it harder to design a beautiful cruise liner than it is to design a beautiful work boat?. Paper presented at RINA International Conference on Marine Design, United Kingdom. Leekitwattana, M., Boyd, S. W., & Shenoi, R. A. (2010). An alternative design of steel-concrete-steel sandwich beam. Paper presented at 9th International Conference on Sandwich Structures (ICSS-9), United States. Sobey, A. J., Blake, J. I. R., & Shenoi, R. A. (2010). Concurrent engineering principles applied to marine composite structures for reduction in production costs through robust design. Paper presented at The Royal Institution of Naval Architects Marine & Offshore Composites, United Kingdom. Hudson, D. A., Dadd, G. M., Chapman, T., & Shenoi, R. A. (2010). Kite assisted propulsion research. 7th Annual Green Ship Technology Conference, Denmark. Underwood, J., Sobey, A. J., Blake, J. I. R., & Shenoi, R. A. (2010). Local stress sensitivity analysis of damaged steel ship hulls. Paper presented at 11th International Symposium on Practical Design of Ships and Other Floating Structures (PRADS), Brazil. Sobey, A. J., Blake, J. I. R., & Shenoi, R. A. (2009). Concurrent design and optimisation of FRP boat structures. Paper presented at Royal Institution of Naval Architects Design Construction and Operation of Super and Mega Yachts, Italy. Sobey, A. J., Blake, J. I. R., & Shenoi, R. A. (2009). Design for Production in FRP Boats. Paper presented at ICCM17: 17th International Conference on Composite Materials, United Kingdom. Sobey, A. J., Blake, J. I. R., & Shenoi, R. A. (2009). Design histories for enhanced concurrent structural design. Paper presented at International Conference on Computer Science and Engineering, (ICCSE), Shanghai, China. Essersi, O., Tarfaoui, M., Boyd, S. W., Meraghni, F., & Shenoi, R. A. (2009). Dynamic study of adhesively bonded double lap composite joints. Paper presented at ICCM17: 17th International Conference on Composite Materials, United Kingdom. Nikolic, D., Allen, R., Collier, R., Taunton, D., Hudson, D., & Shenoi, R. A. (2009). Human factors in the design of high speed marine craft. Poster session presented at Maritime Event for Industry & the Public, United Kingdom. Hudson, D. A., Shenoi, R. A., Hirdaris, S. E., Dadd, G. M., & Chapman, T. (2009). Operational considerations of kite assisted merchant ship propulsion. 2nd Annual ME ShipTech 2009 Conference, United Arab Emirates. Sobey, A. J., Blake, J. I. R., & Shenoi, R. A. (2009). Optimisation of FRP structures for Marine Vessel Design and Production. Paper presented at International Conference on Ocean, Offshore and Arctic Engineering (OMAE), United States. Palaniappan, J., Boyd, S. W., Shenoi, R. A., & Mawella, J. (2009). Repair efficiency of resin infused scarf repair to marine sandwich structures. Paper presented at ICCM17: 17th International Conference on Composite Materials, United Kingdom. Palaniappan, J., Brisoux, S., Boyd, S. W., Shenoi, R. A., & Mawella, J. (2009). Repair efficiency studies on resin infused scarf repaired composite structure. 10th Deformation and Fracture of Composites (DFC 10), United Kingdom. Sobey, A. J., Blake, J. I. R., & Shenoi, R. A. (2009). Stochastic methods used in design optimisation of composite boat hull topologies. Paper presented at 1st International Conference on Light Weight Marine Structures (LIWEM), United Kingdom. Leekitwattana, M., Shenoi, R. A., & Boyd, S. W. (2009). Transverse shear strength of a bi-directional corrugated-strip-core steel sandwich plate. 959-968. Paper presented at Sixth International Conference on Advances in Steel Structures (ICASS’09), . W.J., C., Yeping, X., & Shenoi, R. A. (2009). Use of magnetorheological elastomeric materials as adaptive vibration absorber for propeller shaft. 1-9. Paper presented at Smart 09: Smart Materials and Structures, Portugal. Choi, W. J., Xiong, Y. P., & Shenoi, R. A. (2008). Characterisation of magnetorheological elastomer materials for the core of smart sandwich structures. In A. J. M. Ferreira (Ed. ), Proceedings of the 8th International Conference on Sandwich Structures (ICSS8) (pp. 818-826). Porto, Portugal: Publindústria, Produção de Comunicação, Lda. Shenoi, R. A., Dulieu-Barton, J. M., Quinn, S., Blake, J. I. R., & Boyd, S. W. (2008). Composite materials for marine applications – key challenges for the future. Paper presented at IMAST Workshop on Polymeric and Composite Materials: a Vision for the Future, . Spenkuch, T., Turnock, S., Scarponi, M., & Shenoi, A. (2008). Improvements to a sailing VR simulator environment for assessing and improving helm performance. In M. Estivalet, & P. Brisson (Eds. ), The Engineering of Sport 7 (pp. 65-76). Springer. Spenkuch, T., Turnock, S., Scarponi, M., & Shenoi, A. (2008). Lifting line method for modelling covering and blanketing effects for yacht fleet race simulation. 111-120. Paper presented at 3rd High Performance Yacht Design Conference, . Sobey, A. J., Blake, J. I. R., & Shenoi, R. A. (2008). Optimisation of Composite Boat Hull Structures as Part of a Concurrent Engineering Environment. Paper presented at 6th International Conference on High Performance Marine Vehicles (HIPER), Italy. Sobey, A. J., Blake, J. I. R., & Shenoi, R. A. (2008). Optimization of Composite Boat Hull Structures. Paper presented at 7th International Conference on Computer Applications and Information Technology in the Maritime Industries (COMPIT), Belgium. Spenkuch, T., Turnock, S. R., Wright, A. M., & Shenoi, R. A. (2008). The use of CFD in modelling blanketing effects for yacht race simulations. 126-131. Paper presented at 11th Numerical Towing Tank Symposium, . Lembessis, E., Dulieu-Barton, J. M., & Shenoi, R. A. (2007). Assessment of hygrothermal ageing and damage in sandwich foam using TSA. Paper presented at 13th International Conference on Experimental Mechanics (ICEM 13), . Hu, B., Xing, J. T., & Shenoi, R. A. (2007). Effects of changes in curvatures on the natural characteristics of curved structures. 177-185. Paper presented at MARSTRUCT 2007: 1st International Conference on Marine Structures: Advancements in Marine Structures, . Scarponi, M., Conti, P., & Shenoi, R. A. (2007). Including human performance in the dynamic model of a sailing yacht: a matlab-simulink based tool. 143-156. Paper presented at Modern Yacht, . Scarponi, M., McMorris, T., Shenoi, R. A., Turnock, S. R., & Conti, P. (2007). Robo-Yacht: a human behaviour-based tool to predict the performances of yacht-crew systems. Paper presented at 12th European Congress of Sport Psychology (FEPSAC 2007): Sport and Exercise Psychology Bridges Between Disciplines and Cultures, . Choi, W. J., Xiong, Y. P., & Shenoi, R. A. (2007). Vibration characteristics of smart sandwich beams embedded with magnetorheological elastomer cores. In Advancements in Marine Structures: Proceedings of the 1st MARSTRUCT International Conference, Glasgow, UK, 12-14 March 2007 (pp. 421-428). London, UK: Taylor & Francis. Coe, T., Xing, J. T., & Shenoi, R. A. (2006). A human body model for dynamic response analysis of an integrated human-seat-controller-high speed marine craft interaction system. In 41st United Kingdom Group Meeting on Human Responses to Vibration Institute of Sound and Vibration Research. Scarponi, M., Conti, P., Turnock, S. R., & Shenoi, R. A. (2006). An improved approach for sail design based on the use of design of experiment techniques. In Proceedings of the International Conference on Ship and Shipping Research, NAV 2006 Genoa, Italy: Centro per gli Studi di Technica Navale. Shenoi, R. A., Scarponi, M., Turnock, S. R., & Conti, P. (2006). Combining behavioral models with VPPs to derive a winning yacht-sailor combination. Paper presented at Small Craft 2006: An International Conference on Small Craft Related Sciences and Engineering, . Shenoi, R. A., Blake, J. I. R., Boyd, S., & Mawella, J. (2006). Damage mechanics of FRP ship structures. In Proceedings of the International Conference on Ship and Shipping Research, NAV 2006 (pp. 15pp). Genoa, Italy: Centro per gli Studi di Technica Navale. D'Arcy, T., House, I., Kingsland, P., Spink, R., Yuceulug, M., Hudson, D., & Shenoi, R. (2006). Design of high performance craft from a human factors perspective. Symposium on Human Performance at Sea: Influence of Ship Motions on Biomechanics and Fatigue, . Scarponi, M., Shenoi, R. A., Turnock, S. R., & Conti, P. (2006). Interactions between yacht-crew systems and racing scenarios combining behavioral models with VPPs. In Proceedings of the 19th International HISWA Symposium on Yacht Design and Yacht Construction (pp. 109-121). Amsterdam, The Netherlands: Handel en Industrie op het Gebied van Scheepsbouw en Watersport. Lewis, S. G., Hudson, D. A., Turnock, S. R., Blake, J. I. R., & Shenoi, R. A. (2006). Predicting the motions of high speed RIBs: a comparison of non-linear strip theory with experiments. In Proceedings of the 5th International Conference on High Performance Marine Vehicles (HIPER '06) (pp. 210-224). London, UK: WEGEMT: Royal Institution of Naval Architects. Maneepan, K., Jeong, H. K., & Shenoi, R. A. (2005). Optimisation of FRP top-hat stiffened single skin and monocoque sandwich plates using genetic algorithm. Paper presented at The Fifteenth International Offshore and Polar Engineering Conference, . Narasimhan, S., Shenoi, R. A., Blake, J. I. R., & Boyd, S. (2005). Stress concentrations in a three dimensional hybrid composite-steel joint model. Paper presented at 5th International Conference on Composite Science and Technology (ICCST), . Jarry, E., Kapadia, A., Shenoi, R. A., & Miao, S. H. (2004). Design and fabrication of an adhesively bonded aluminium superstructure. In Proceedings of the 9th International Symposium on Practical Design of Ships and other Floating Structures, PRADS 2004 (pp. 982-987). PRADS. Earl, J. S., Dulieu-Barton, J. M., & Shenoi, R. A. (2004). Thermoelastic stress analysis as a validation tool for FEA of composite tee joint. 4 pages. Paper presented at NAFEMS Seminar on FEA Versus Test, . Nayak, A. K., Moy, S. S. J., & Shenoi, R. A. (2003). A study of the effect of initial in-plane stresses on vibration and buckling of damped sandwich plates. Paper presented at Sixth International Conference on Sandwich Structures, . Nayak, A. K., Moy, S. S. J., & Shenoi, R. A. (2003). Buckling and vibration of initially stressed composite sandwich plates. Paper presented at Eighth International Conference on Recent Advances in Structural Dynamics, . Jeong, H. K., Shenoi, R. A., & Dulieu-Barton, J. M. (2003). Design and production issues concerning bonded joints for segmented FRP composite hulls. 449-459. Paper presented at Eighth International Marine Design Conference (I.M.D.C. 2003), . Boyd, S. W., Blake, J. I. R., Shenoi, R. A., & Mawella, J. (2003). Fatigue life characterisation of hybrid composite-steel joints. Paper presented at Proceedings of the Royal Institution of Naval Architects Conference on Advanced Marine Materials: Technology and Applications, . Wang, W., Makarov, G., & Shenoi, R. A. (2003). Investigating high strain rate behaviour of unidirectional composites by a visco-elastic model. Paper presented at Proceedings of The International Symposium on Naval Architecture and Ocean Engineering, . Jeong, H. K., & Shenoi, R. A. (2002). Application of structural reliability techniques to the design of a FRP laminated composite plate. CD Rom. Paper presented at 1st International Colloquium on ASRANet Integrating Structural Reliability Analysis with Advanced Structural Analysis, . Shenoi, R. A., & Blake, J. I. R. (2002). Damage Mechanics of FRP Ship Structures. In Proceedings of the International Conference on Ship and Ocean Technology, SHOT’02 Kharagpur, India: Indian Institute of Technology. Nayak, A. K., Shenoi, R. A., & Moy, S. S. J. (2002). Damping prediction of composite sandwich plates using assumed strain plate bending elements based on Reddy's higher order theory. Paper presented at 43rd AIAA/ASME/ASCE/AHS/ASC Structures, Structural Dynamics and Materials Conference, . Trask, R. S., Shenoi, R. A., & Cripps, R. M. (2002). Design approach for repair adequacy in RNLI polymer composite sandwich structures - an overview. In A. G. Gibson (Ed. ), FRC 2002: 9th International Conference on Fibre Reinforced Composites Conference Design Consultants. Wang, W., & Shenoi, R. A. (2002). Local instability in curved composite beams. 249-256. Paper presented at Proceedings of the 9th International Conference on Fibre Reinforced Composites (FRC 2002), . Nayak, A. K., Shenoi, R. A., Moy, S. S. J., & Blake, J. I. R. (2002). Transient analysis of composite sandwich plates using assumed strain plate bending elements based on Reddy's higher order theory. In R. A. Shenoi, S. S. J. Moy, & L. C. Holloway (Eds. ), Advanced Polymer Composites for Structural Applications in Construction: Proceedings of the ACIC 2002 Conference (pp. 347-358). London, UK: Thomas Telford. Thibaudeau, M., & Shenoi, R. A. (2002). Understanding flow behaviour in the resin infusion moulding process. In Proceedings of the 10th European Conference on Composite Materials, ECCM-10 European Conference on Composite Materials. Shenoi, R. A., & Wang, R. A. (2001). An analytical solution to the design of tee connections in FRP ships. 339-1344. Paper presented at Proceedings of the of the 8th International Symposium on the Practical design of Ships and Mobile Offshore Units (PRADS 2001), . Shenoi, R. A. (2001). Damage modelling in tee connections in FRP ships. In Proceedings of the 22nd SAMPE Europe International Conference (pp. 451-464). Paris, France: Society for the Advancement of Material and Process Engineering. Nayak, A. K., Shenoi, R. A., & Moy, S. S. J. (2001). Modelling damping effects in sandwich structures using the finite element method. Paper presented at International Conference on Theoretical, Applied, Experimental and Computational Mechanics, . Shenoi, R. A., & Wang, W. (2001). Theoretical analysis on the bending of curved sandwich beam. 67-75. Paper presented at Proceedings of the 6th International Conference on Deformation and Fracture of Composites (DFC6), . Earl, J. S., Dulieu-Barton, J. M., & Shenoi, R. A. (2001). Thermoelastic stress analysis of aged sandwich structures. Paper presented at ICCM13: 13th International Conference on Composite Materials, . Ring, D., & Shenoi, R. A. (2000). Application of SADT to decompose ship design in a production context. Paper presented at Proceedings of the SNAME Ship Production Symposium, . Ring, D., & Shenoi, R. A. (2000). Evaluation of an analysis method used to decompose ship systems design. 199-206. Paper presented at Proceedings of the International Naval Engineering Conference 2000, . Ring, D., & Shenoi, R. A. (2000). Innovative product development & structured decomposition techniques for design processes. 6.1-6.16. Paper presented at Proceedings of the RINA Conference on European Shipbuilding in the 21st Century, . Jeong, H. K., & Shenoi, R. A. (2000). Probabilistic failure analysis of FRP sandwich plates. 402-412. Paper presented at Proceedings of the 8th International Conference on Fibre Reinforced Composites, . Noury, P. M. C., Shenoi, R. A., & Sinclair, I. (2000). Shear properties degradation and fatigue crack growth in closed-cell PVC foam. In D. Zenkert, & H. R. Meyer-Piening (Eds. ), Proceedings of the Fifth International Conference on Sandwich Construction (pp. 177-188). Clifton upon Teme, UK: Engineering Materials Advisory Services (EMAS). Ring, D., & Shenoi, R. A. (2000). Use of structured definition techniques to decompose the design process vis-a-vis producibility considerations. 527-538. Paper presented at Proceedings of the 7th International Marine Design Conference, . Grigg, J. S., Dulieu-Barton, J. M., & Shenoi, R. A. (2000). Validation of a complex composite construction using thermoelastic stress analysis. 355-358. Paper presented at Proceedings of the 2000 SEM IX International Congress, . Shenoi, R. A., & Moy, S. S. J. (1999). Engineering challenges in the use of advanced composites in made-to-order products. Paper presented at Conference on Composites and Plastics in Construction, United Kingdom. Moy, S. S. J., Shenoi, R. A., Feng, Z. N., Padhi, G. S., & Allen, H. G. (1999). Progressive damage analysis of glass-reinforced plastics (GRP) panels under extreme transverse pressure loading. In A. Maji (Ed. ), Advances in Composite Materials and Mechanics (pp. 24-33). American Society of Civil Engineers. Cossich, N., Shenoi, R. A., & Wilson, P. A. (1998). Flexural characteristics in in-plane adehesively bonded sandwich structures. 493-504. Paper presented at 4th International Conference on Sandwich Joints, . Jeong, H. K., & Shenoi, R. A. (1998). Reliability analysis of specially orthotropic plates using Hasofer-Lind's safety index method. In Proceedings of the 17th International on Offshore Mechanics and Arctic Engineering (pp. 98-1485). New York, USA: American Society Of Mechanical Engineers (ASME). Jeong, H. K., & Shenoi, R. A. (1997). Modelling uncertainties in the optimal design of composite plates. Paper presented at 6th International Marine Design Conference (IMDC’97), . Jeong, H. K., & Shenoi, R. A. (1996). Damage in FRP plates subjected to lateral pressure bending. Paper presented at 2nd Postgraduate Conference on Engineering Materials, . Weitzenbock, J. R., Shenoi, R. A., & Wilson, P. A. (1996). Measurement of three dimensional permeability. Paper presented at FPCM'96: Fourth International Conference on Flow Processes in Composite Materials, . Sutherland, L. S., Shenoi, R. A., & Lewis, S. M. (1996). Use of statistically designed experiments to explore sensitivities in the strength scaling of FRP composites. In Proceedings of 1st Australasian Congress on Applied Mechanics (pp. 61-86). Australia: National Committee on Applied Mechanics of Engineers Australia. Weitzenbock, J. R., Shenoi, R. A., & Wilson, P. A. (1995). Flow front measurement in RTM. 307-314. Paper presented at ICAC'95 - 4th International Conference on Automated Composites, . Weitzenbock, J. R., Shenoi, R. A., & Wilson, P. A. (1994). Characterisation of resin flow through thick laminates in resin transfer mouldings. In A. Poursartip, & K. Street (Eds. ), Proceedings of the Tenth International Conference on Composite Materials (pp. 301-308). Woodhead Publishing Limited. Scarponi, M., Shenoi, R. A., Turnock, S. R., & Conti, P. (1970). A combined ship science-behavioural science approach to create a winning yacht-sailor combination. Paper presented at The 18th Chesapeake Sailing Yacht Symposium, . Nayak, A. K., Moy, S. S. J., & Shenoi, R. A. (1970). Dynamic response of initially stressed composite sandwich plates. In L. C. Hollaway (Ed. ), Advanced Polymer Composites for Structural Applications in Construction: ACIC 2004 (pp. 525-534). Abingdon, UK: Woodhead. Bardet, R. R., Shenoi, R. A., & Boyd, S. W. (1970). The use of life cycle tools towards sustainable thermoplastic composites in ship building. 2008 SAMPE Europe International Conference and Forum, . Dulieu-Barton, J. M., Shenoi, R. A., Quinn, S., Blake, J. I. R., & Boyd, S. W. (1970). US Office of Naval Research, Solid Mechanics Program Review. 20-31. Paper presented at Office of Naval Research, Solid Mechanics Program Review, . Shenoi, R. A., Bowker, J. A., Dzielendziak, A. S., Lidtke, A. K., Zhu, G., Cheng, F., ... Westgarth, R. (2015). Global Marine Technology Trends 2030. Southampton, GB: University of Southampton. Blake, J. I. R., Das, P. K., Yang, N., Sobey, A. J., & Shenoi, R. A. (2009). Stochastic analysis of stiffened panels – phase 3:WP3.1 & 3.2. University of Southampton. Blake, J. I. R., Das, P. K., & Shenoi, R. A. (2008). Stochastic Analysis of Stiffened Panels – Phase 2. University of Southampton. Shenoi, R. A., & Groves, A. (2005). Materials and structures research thrusts: recommendations for the maritime environment. (Ship Science Reports; No. 139). Southampton, UK: University of Southampton. Nayak, A. K., Makarov, G., Shenoi, R. A., & Groves, A. (2005). Unconventional structures with hybrid materials with superelastic inserts. Southampton, UK: University of Southampton. Scarponi, M., Turnock, S. R., & Shenoi, R. A. (2004). Numerical simulations of mini 6.50 composite masts. (Ship Science Reports; No. 131). Southampton, UK: University of Southampton. Jarry, E., Meunier, M., Miao, S. H., & Shenoi, A. (2002). Report on performance of bonded joints used in a patrol craft. BONDSHIP. Shenoi, R. A., Dulieu-Barton, J. M., Jeong, H. K., Winkle, I. E., Day, A. H., & Boyd, S. W. (2002). Use of pre-formed composites for cost-effective fast marine craft construction. University of Southampton. Shenoi, R. A., & Hawkins, G. L. (1996). Micromechanics approaches to predict damage in FRP composite laminates. (Ship Science Reports; No. 97). Southampton, UK: University of Southampton. Phillips, H. J., & Shenoi, R. A. (1995). Approaches to assessment of damage tolerance levels in FRP structures. (Ship Science Reports; No. 88). Southampton, UK: University of Southampton. Phillips, H. J., & Shenoi, R. A. (1994). Analytical modelling concerning onset of delamination in FRP beam panels. (Ship Science Reports; No. 82). Southampton, UK: University of Southampton. Junhou, P., & Shenoi, R. A. (1994). Detailed research review of the performance characteristics of out-of-plane joints in FRP marine structures. (Ship Science Reports; No. 83). Southampton, UK: University of Southampton. Junhou, P., & Shenoi, R. A. (1994). Stiffness matrix of an anisotropic layered plate element based on equilibrium equations derived directly from the principle of virtual displacements. (Ship Science Reports; No. 85). Southampton, UK: University of Southampton. Junhou, P., & Shenoi, R. A. (1994). The stiffness matrix of an 8-node laminated plate element based on Reddy's higher-order shear deformation theory. (Ship Science Reports; No. 65). Southampton, UK: University of Southampton. Junhou, P., & Shenoi, R. A. (1994). The stiffness matrix of an 8-node laminated plate element taking into account higher-order shear deformation and geometric nonlinearity considerations. (Ship Science Reports; No. 66). Southampton, UK: University of Southampton. Clark, S. D., Shenoi, R. A., & Allen, H. G. (1993). Fatigue characteristics of FRP sandwich beams for marine applications. (Ship Science Reports; No. 67). Southampton, UK: University of Southampton. Shenoi, R. A., & Hawkins, G. L. (1993). Large deflection behaviour of GRP panels with attachments. (Ship Science Reports; No. 68). Southampton, UK: University of Southampton. Moy, S. S. J., Shenoi, R. A., Allen, H. G., & Miao, S. (1992). The behaviour of modern marine composite panels under extreme pressure loads. Southampton, GB: University of Southampton. Shenoi, R. A., & Hawkins, G. L. (1991). Large deflection behaviour of grp panels with attachments: a preliminary study. (Ship Science Reports; No. 47). Southampton, UK: University of Southampton. Shenoi, R. A. (1990). Structural producibility considerations at a preliminary design level. (Ship Science Reports; No. 40). Southampton, UK: University of Southampton.